For small thermal cameras, ULIS is presenting the ATT0640 at the SPIE Defence and Commercial Sensing show in Baltimore, Maryland, USA (14 to 18 April). It is claimed to be the world’s smallest 60Hz VGA/12 micron thermal image sensor and enables the use of smaller thermal cameras with extended battery autonomy in portable equipment for commercial and defence applications. The sensor can be used in thermal weapon sights (TWS), surveillance and handheld thermography cameras, as well as personal vision systems (PVS), including portable monoculars and binoculars for consumer outdoor leisure, law enforcement and border control. The PVS segment alone, is expected to see annual unit growth of 30 per cent between 2018 to 2024 (according Yole Developpement: Uncooled Infrared Imagers and Detectors 2019). The Atto640 measures 16.5 x 16.5mm and is designed to address the size, weight and power (SWaP) reduction requirements across commercial and defence thermal image applications. The surface mount VGA format device joins the existing QVGA Atto320 to give camera manufacturers more choice in the company’s 12 micron product range. ULIS adds that compared to 17 micron pixel pitch technology, the 12 micron pitch enables them to use smaller and lower cost optics. 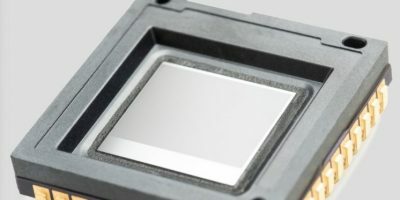 Atto640 uses wager level packaging (WLP) to achieve the size advantage, describing this technology, in which the detector window is directly bonded to the wafer, as enabling a significant reduction in the overall dimension of the sensor. The footprint of the Atto640 footprint is half the size of ULIS’ Pico640-046 (17 micron) model. The WLP enables a batch-processing technique and is suited to high-volume production. Samples of Atto640 are currently available, with production ramp-up slated for the end of 2019. ULIS intends to further extend its 12 micron product line up with larger resolution sensors. ULIS is a subsidiary of Sofradir. It designs and manufactures thermal image sensors for commercial, defence and security applications. Established in 2002, ULIS claims to be the world’s second largest producer of thermal image sensors (microbolometers), exporting 97 per cent of its products to camera makers across Europe, Asia and North America. ULIS products range from low-resolution to megapixel military-grade sensors. They are used to detect threats, diagnose heat loss, avoid road obstacles, perform air-to air refuelling, locate search and rescue victims and observe nature.